Double LP version. 180 gram vinyl; Gatefold sleeve. Original master concert recording from January 22nd, 1954 in Cologne, recorded at the trade fair area Kölner Messe, Halle V, West Germany. Previously unreleased, respectively released for the first time in 2014 -- a release in the WDR The Cologne Broadcasts series. Credits and liner notes by journalist and radio host Karsten Mützelfeldt in English and German. Both, Billie Holiday and the Buddy DeFranco Quartet, were part of the package tour entitled Jazz Club USA to perform in Scandinavia, the Netherlands, France, Switzerland, and Germany in January 1954. It was Billie Holiday's first European tour and the story goes that the star was badly beaten up by her husband the night before the Cologne show and had Billie Holiday to appear on stage wearing dark sunglasses. 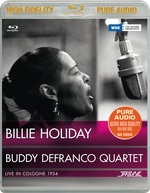 Personnel for Billie Holiday: Billie Holiday - vocals; Carl Drinkard - piano; Red Mitchell - bass; Elaine Leighton - drums; Personnel for the Buddy DeFranco Quartett: Buddy DeFranco - clarinet; Sonny Clark - piano; Gene Wright - bass; Bobby White - drums. Executive producer - Franz-Josef Schwarz. Mastered by John Cremer.